We left off from Dahlia with only a name, a name that is the next piece to the puzzle. A name that will eventually, 'lead us to him.' But before we delve into the continuation of the Blood Crave Series, let's answer the question that's been on all our minds. The mean streets were no place for orphaned, twelve year old Rowan Miller. For the past three months, Rowan has lived on the streets since her alcoholic father's passing, having never known her mother, who passed when Rowan was an infant. Seeking shelter under a bridge in the dead of night, Rowan is approached by a tall, almost brooding man in his twenties, and although startled, she immediately feel that this man means her no harm. His presence a warm comfort, a kindred spirit. Kaji can feel Rowan's heart crying out for help. Kaji is a Lamia, or vampire, as determined by today's pop culture references, and offers Rowan the opportunity and safety of food and shelter, in exchange for the talkative and boisterous girl to teach Kaji what it is like to be human again. Kaji quickly becomes the only person that Rowan can rely upon, with the two now finding what they both needed most... Family. As the years pass, Kaji and the mysterious Lamia Adam train Rowan, teaching her weaponry and defense, but nothing could prepare Rowan for her first encounter with the Lapsus, or fallen angel, as she was brutally stabbed taking out the trash during her first shift as a waitress at a local cafe. Kaji, hearing her silent plea for help, rushes to her aid, only to find Rowan's life draining from her bleeding body. Kaji has no other choice, she is his reason for existing and the only way to bring her back, is to turn her. But is he too late? He flees with Rowan's body to the Cross household. The family being derived from the fallen, but a family Kaji's trusts with his life... And Rowan's. Remy is instantly taken with the still, lifeless Rowan, her beauty mesmerising. But after seven years of caring for Rowan, Kaji needs to leave. He cannot endanger her life any further, whether she is human or not. As Rowan adjusts to her new life as a Lamia, Remy now becomes her anchor, her tie to her humanity. But it seems that Kaji leaving doesn't guarantee her safety. 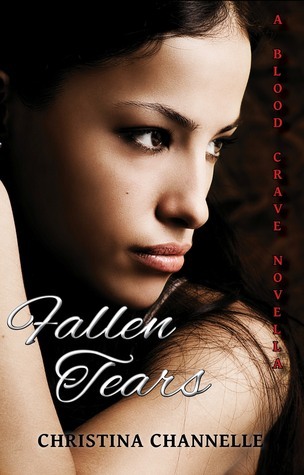 Fallen Tears is a short novella as part of the Blood Crave series, which tells the heart wrenching story of Rowan, the orphaned girl who finds her savior in the form of Kaji, a vampire. It was beautifully written and emotionally charged and fills in the blanks between Dahlia and Rowan, books one and two. Fallen Tears has left me eager to start Rowan, and I cannot wait to continue the series. It was a pleasure reading it. You're always welcomed to lurk around on here. Why else do you think I leave the light on at night?